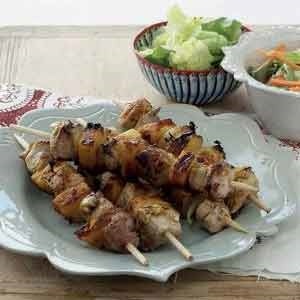 Alternate the pork, pineapple and onion wedges on skewer sticks. Mix the brown sugar, chilli, lemon juice, rind and curry powder together and rub into the pork. Marinate for about 20 minutes. Heat a heavy-bottomed frying pan, season the kebabs and fry a few at a time until both sides are golden brown and cooked through. Repeat until all the kebabs are cooked. Serve with couscous, rice or salad. TIP Try braaiing the kebabs on the coals or grill in an oven.